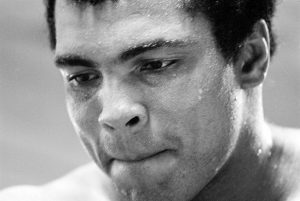 Muhammad Ali was still boxing professionally when observers first noticed signs of neurological decline, and many have been quick to link his profession to his diagnosis, years later, of Parkinson’s disease. In the decades that followed, and with Ali’s death Friday at the age of 74, however, a stubborn fact remains: Neurologists cannot definitively say whether Ali’s symptoms were a result of his boxing career. But they said head trauma does increase the risk. Sherer, who holds a PhD in neuroscience, said a 2006 study published in Annals of Neurology helped establish that risk. In the study, a team led by Dr. Samuel Goldman, of the Parkinson’s Institute and Clinical Center in Sunnyvale, Calif., followed the cases of 93 pairs of twins in which only one of each had Parkinson’s. Those who had sustained at least one head injury were more likely than their twin to have a later diagnosis of Parkinson’s, and the likelihood increased in those with more than one head injury. Parkinson’s is a progressive nervous system disorder in which vital nerve cells in the brain malfunction and die, curbing the production of dopamine, the chemical that sends messages to the part of the brain that controls motor skills. Symptoms include tremors, slowed movement, and speech changes, among others. There is no cure, but treatment options can help manage symptoms. Based on more recent studies of laboratory animals, Goldman said that he believes those who suffer two episodes of brain trauma within a short period of time are more likely to experience degenerative brain symptoms later in life. “It can really set off a degenerative cascade,” he said. Dr. Rodolfo Savica, a physician and researcher with the Mayo Clinic, agreed that those who suffer head trauma are more likely to face a diagnosis of Parkinson’s later in life. Genetic components, he and others believe, are also at play. “There is definitely an individual predisposition to develop this disease that we think can be potentially enhanced by the head trauma itself,” he said. “We know that at some threshold, once crossed, exposure to traumatic brain injury and repetitive brain injury sets the stage for early onset forms of neurodegeneration,” he said. This article is reproduced with permission from STAT. It was first published on June 4, 2016. Find the original story here.